Video streaming giant Netflix sees piracy as its biggest competitor. The rise of Popcorn Time, often branded as the Netflix for Pirates, is particularly problematic for the company as it's packed with the latest blockbusters and easier to use than traditional torrent sites. The Popcorn Time app brought peer-to-peer streaming to a mainstream public last year. Branded the “Netflix for Pirates” it became an instant hit by offering BitTorrent-powered streaming in an easy-to-use Netflix-style interface. This was cause for concern for many Hollywood executives and Netflix itself is now also starting to worry. In a letter to the company’s shareholders Popcorn Time gets a special mention. “Piracy continues to be one of our biggest competitors,” Netflix CEO Reed Hastings writes. 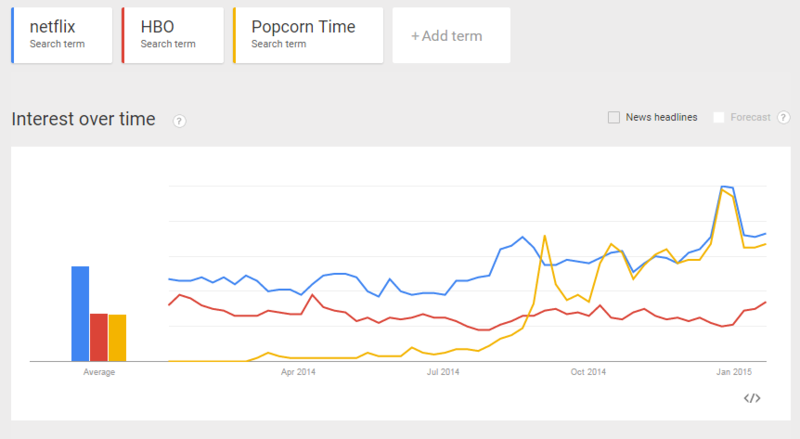 “This graph of Popcorn Time’s sharp rise relative to Netflix and HBO in the Netherlands, for example, is sobering,” he adds, referencing the Google trends data below showing Popcorn Time quickly catching up with Netflix. While it’s a relatively small note, Hastings’ comments do mark a change in attitude for a company that previously described itself as a piracy killer. Netflix’s CEO previously noted that piracy might even help the company, as many torrent users would eventually switch to Netflix as it offers a much better user experience. “Certainly there’s some torrenting that goes on, and that’s true around the world, but some of that just creates the demand,” Hastings said last year. “Netflix is so much easier than torrenting. You don’t have to deal with files, you don’t have to download them and move them around. You just click and watch,” he added. The problem with Popcorn Time is that it’s just as easy as Netflix, if not easier. And in terms of recent movies and TV-shows the pirated alternative has a superior content library too. A study published by research firm KPMG previously revealed that only 16% of the most popular and critically acclaimed films are available via Netflix and other on-demand subscription services. Despite the Popcorn Time concerns, business is going well for Netflix. The company announced its results for the fourth quarter of 2014 which resulted in $1.48 billion in revenue, up 26%, and a profit of $83 million.